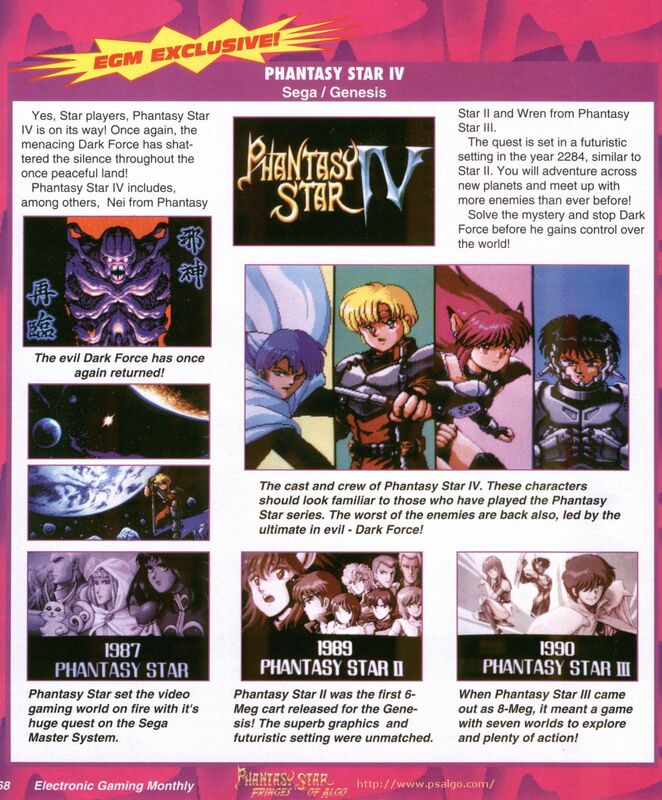 The first Electronic Gaming Monthly preview of Phantasy Star IV displays screens taken from a prototype showcased at the 1992 Tokyo Toy Show. This prototype was used to announce the game to the public and showcase the intention to connect it to the previous installments. Unfortunately the prototype no longer exists, so previews like this one are the only way to see some of this artwork. Interesting to see that your numan companion was still Nei back then. (even with the familiar red eyes) And the promise of the adventure taking place in a futuristic world, rather than a post-apocalyptic futuristic world. Some great pics there, And, I especially enjoyed this one as it was written in English and I could read and understand every word. Erpy wrote: Interesting to see that your numan companion was still Nei back then. (even with the familiar red eyes) And the promise of the adventure taking place in a futuristic world, rather than a post-apocalyptic futuristic world. Yeah, the game changed quite a bit from these early descriptions. Even Dark Force was completely redesigned. It's such a shame that we'll never get to see that original version. Silver_Surfer1 wrote: Some great pics there, And, I especially enjoyed this one as it was written in English and I could read and understand every word. That is a nice change from all the Japanese text, isn't it? These old gaming magazines were so great back in the day. Bumping this former Image Of The Day up again. Awesome memories always found in every issue of Electronic Gaming Magazine.